I know most of you are well into spring now... emerging from your wintery caves, blinking at the bright new sun, frolicking in the flowers, and enjoying the warmer weather. For some of us, though, it's autumn! The days are getting shorter, the nights cooler. I'm wearing flannel pants and sipping a piping hot cup of tea as I type this, and I have a pretty autumn-themed manicure to show you! 'scuse the messy bit around my index finger. Didn't bother with neatening the cuticles since I was about to start stamping! I then stamped with CQ #455 Chocolate Plum and Red Angel plate RA-104. Leaves and swooshy lines that seem to suggest them blowing in the wind :) The brown polish is rather sheer, which gave me the subtle look I was going for, as well as letting the silver shimmer show through. Finally, a glitter gradient tip with the polish I really wanted to use, and that inspired the rest of the design--Orly So Go-Diva! It's from their Flash Glam FX collection, and I've had it for ages, but had not worn it yet. I love the double-entendre of a name: one definitely feels like a diva when wearing such reflective glitter, and it's also a perfect Godiva-chocolate shade! 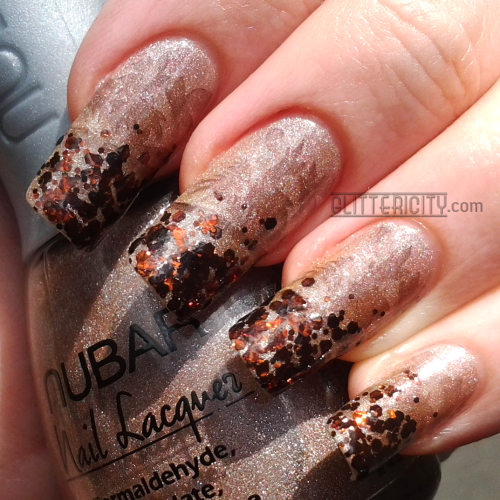 Small and large yummy brown glitters in a slightly-blackened jelly base. 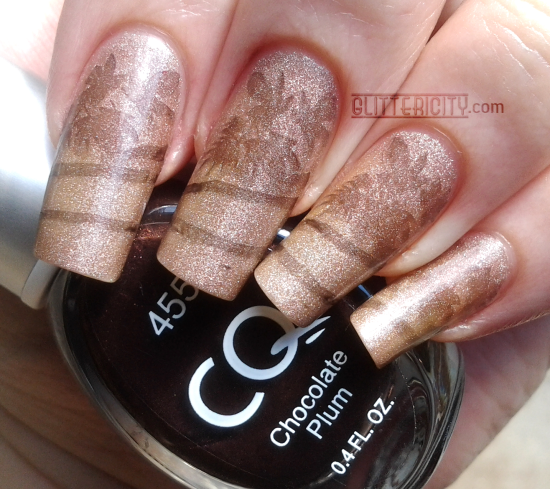 I used a makeup sponge to dab this onto the tips, following the slight diagonal lines of the stamp. Topcoated with KBShimmer Clearly On Top. Outdoors in shade. The brown glitters look so delicious! They do kind of overtake the stamping, though. Maybe I shouldn't have gone so subtle, eh? 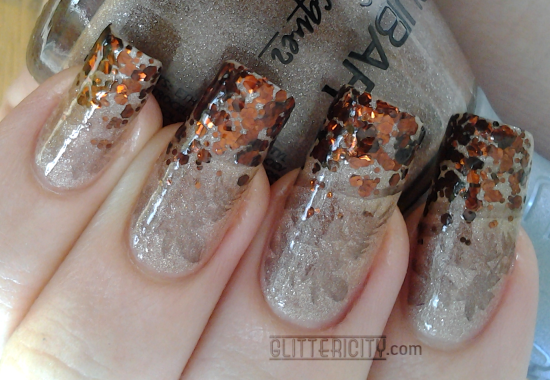 Even if the stamping didn't end up being very obvious when contrasted with the glitter, I still like the two-toned look. In this shot it sort of looks like I did a distressed or saran-wrap look for the base, which is pretty too! Do you love browns and neutral shades, or do you normally gravitate towards brighter, bolder polishes like I do?